Each time you make a reservation through this website, your reservation is made directly with Abali Studios. As such, you are guaranteed the lowest possible rate, unlike reservations made through third party systems (whose prices include the given platform’s commission). To send a reservation enquiry directly to Abali Studios click here! 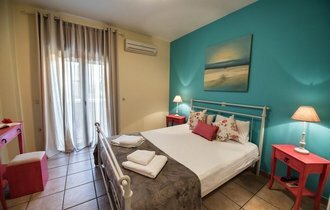 Abali Studios is located in Lefkas Town, on Lefkada island, in a beautiful and quiet spot in the area of Neapolis, a five minute distance from the town centre. 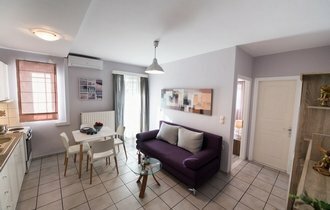 It is built in a marvelous walled-off garden and offers its guests spacious studios and apartments that can accommodate from 2 to 6 people accordingly. Abali Studios features a garden with lawn and fence for the security of children at play 2 mini markets, super market, green-grocer, butcher in the neighborhood, and very accessible parking. With Abali Studios as a starting point you can explore all of the island of Lefkada. The closest beaches of the town are Agios Ioannis, Mili, Ammoglossa, Gyra. Here you can wind surf, canoe, kite-surf and water bike around the sea-lake. The beaches of Gyra and Ammoglossa are ideal for children. The most famous beaches of the island, Kathisma, Agios Nikitas, Mylos, Pefkoulia, which are at a distance of 20 minutes. That is how far the cosmopolitan Nidri is as well. We also recommend you visit the beaches of Porto Katsiki and Egremni.